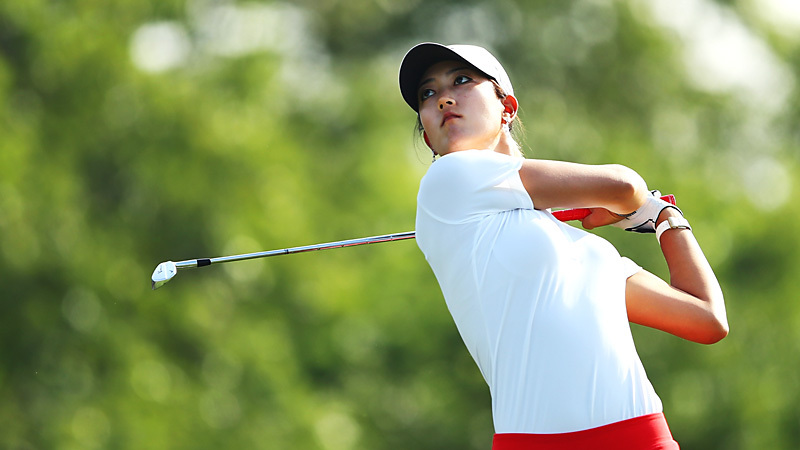 This will be Michelle Wie’s third Solheim Cup; she has been a captain’s pick two of those times. ST. ANDREWS, Scotland -- There isn't a lot in women's golf that prompts passionate argument -- much is the pity -- but one topic does tend to generate strong opposing viewpoints. That's the subject of Michelle Wie. There are those who think she's the prototypical hype creation, a player whose fame vastly outweighs her achievements, and that those two things will never balance out. Others contend that's an overly harsh assessment, that regardless of any of her less-successful competitive endeavors -- or publicity stunts, in some eyes -- at 23, she remains a developing player with plenty of potential. 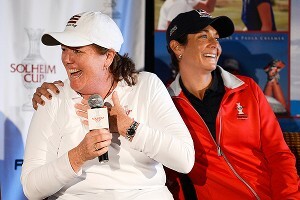 U.S. Solheim Cup captain Meg Mallon has the latter view. On Sunday after the Women's British Open, when Mallon announced Wie as one of her captain's picks, she knew there would be critics. There usually are for captains of the Ryder or Solheim cup. And because it was Wie, some of the criticism was more energized. U.S. captain Meg Mallon said she was looking for players known for length and birdie-making ability, and Michelle Wie fit the bill. "It literally came down to the last minute -- Morgan [Pressel] had to finish No. 17 before I could make my decision," Mallon said of how Pressel ended up earning a spot based on moving up in the world rankings with her tied-for-fourth finish. "Once I made my decision, I felt really good about it. Every captain says that, but that's what it comes down to: your gut. I pored through stats, and then it literally came down to how I felt." Wie shot rounds of 74-70-78-75 to finish 9-over 297 and tied for 56th at the Women's British. Wie, who has a 4-3-1 record in two previous Solheim appearances, knew she was not going to qualify based on points, so she needed to be one of the two selections. She had to wait until the conclusion of the tournament to find out. "My stomach was in complete knots today," Wie said after she was picked. "I think I can eat now. I was preparing myself either way, and then Meg asked me, 'How would you like to play in Denver?' As soon as I heard those words, I started bawling. I'm just so happy." 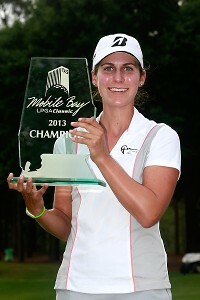 Mallon went with two players known for both their length and birdie-making ability: Wie and Gerina Piller. "It's a second-shot golf course; it's wide-open off the tee," Mallon said of Colorado Golf Club, just south of Denver, where the event will be played Aug. 16-18. "I needed some players who have a creative short game, and Michelle has one of the best." Most prominent among the players left out was Jennifer Johnson, who won once on tour this year, missed the cut at the Women's British, and at age 22 has never played in the Solheim Cup. Jennifer Johnson was among the contenders who didn’t make the team; she has a tour win this year, something Michelle Wie hasn’t done since 2010. Nicole Castrale and Natalie Gulbis were the top-finishing Americans at the Women's British (tied for ninth) who didn't make the Solheim team. Castrale was 2-5-0 in her two previous Solheim appearances, while Gulbis has played in the USA-Europe team competition three times, with a record of 5-4-1. Castrale's play has been limited by a shoulder injury in 2010 and the birth of her child in 2011. Her best finish thus far in 2013 is a tie for eighth. The Women's British is Gulbis' best finish of this year. You could argue that Wie, also a captain's pick in 2009, was selected as much for lack of a more compelling candidate as she was for her own merits. That said, Mallon said she kept coming back to the clinching factors in favor of Wie. "Michelle Wie can handle being on a big stage," Mallon said. "And I kept thinking, 'Do I want to leave five or six birdies a round at home on the couch?' And she's someone who has played in the Solheim Cup and has that experience. I don't have to worry about that part. I have four rookies, and Michelle will be a leader for me. "It's really corny, but I also kept thinking, 'This is my Greg Norman/Adam Scott moment.' I believe in her so much, the player that she is and the person that she is." For the 2009 Presidents Cup, Norman picked Scott even though Scott had missed the cut 10 times in his previous 13 events. Scott went 1-4 in that Presidents Cup, but he has credited Norman's selection with helping to re-ignite his confidence. Wie, ranked 82nd in the world, is not in a slump as deep as Scott's was, but she appreciates the boost the Solheim selection gives her. "I'm so happy to be able to experience this again," Wie said. "It means so much to me that Meg has enough confidence in me to pick me. That she has faith in me." Wie's two LPGA Tour wins were in 2009 and 2010; her best finish in 2013 is tied for ninth. That's one of three top-10s she's had in the past two seasons. She's had rounds when her talent shows -- such as the second round here at the Old Course -- but also others when she appears pedestrian at best. Much has been made of the latest incarnation of Wie's putting stance, an awkward-looking tripod-like position. Wie had 134 putts at St. Andrews; winner Stacy Lewis had 124. Wie's teammates backed up her selection, not that you'd expect any of them to publicly say otherwise going into the event. "I was excited when I saw it," Brittany Lincicome said. "Denver is a long golf course, and she's a bomber. That's definitely going to come into play there." Mallon said Wie really does deserve this chance. "She's under a microscope every single day she plays," Mallon said. "And the way that she handles herself is incredible. I know, being home in the States and having these crowds, she can handle that better than anybody. She's got no fear."